Tell Me. What Could He Be Thinking? Though part of writing a romance novel is to create fantasy, I still want the male lead to be someone we might know in real life. In my pursuit of understanding men (much easier to accept as a writer, not a girlfriend/wife), I read No More Mr. Nice Guy! and found examples of men who are not yet ready for a healthy relationships. In What Could He Be Thinking? 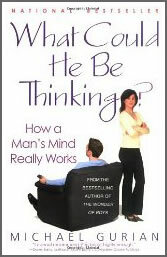 by Michael Gurian, he opened my eyes to things men do that seem strange and sometimes even illogical to women. Here are a few things that jumped out at me. That is sad to me because 1 tells me that they no longer to care for each other and 2 tells me they are married to a stranger. How did any couples get to this point from being close enough to get married? I cringe at the thought of it. A man feels by DOING. I guess that’s why they try to fix women’s problems instead of listening. The author suggests for the ladies to have a group of girlfriends to talk things out. This makes total sense to me. I think most women would appreciate a man who takes action than the one who doesn’t. Besides, by talking his ears off, he might not hear your request for him to jump into action for your sake. Years ago, I asked my then boyfriend a serious question, he didn’t react. I thought he was ignoring me. After a few days, he answered and explained he needed time to consider his response because he didn’t want to take it lightly. So, I’d say this is true. Give him time to think is a really good tip. Respond to emotion by being physical. When he’s emotional, he might go for a run, take a drive, or can’t stay put. Masking emotion while processing emotion. it’s nothing to worry about – recalling amplifies the hurt. This should go for women as well. If all we do is retelling the same issue and not making any changes, what we are doing is the carving a deep groove into the pain we already feel. And still no actual improvement in the end. I’m only half way through the book but I am already a bit more confident in writing more complete male characters. This entry was posted in I Read This, Musing and tagged Michael Gurian, relationship, understanding male, What Could He Be Thinking, writing male characters by n2n. Bookmark the permalink.